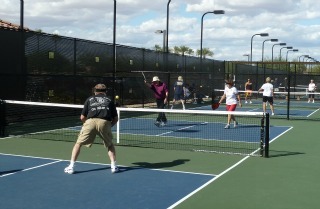 These active and https://www.frugal-retirement-living.com folks are enjoying a game of pickleball. It is played on a 22' x 44', were the same as a doubles badminton court... it was invented in 1965 in Washington state. It combines some elements of ping-pong, badminton and tennis...it is a very fun and fast-paced game that can be played by anyone, at any age. The pickleball it self is like a wiffleball, and the game can be played in singles or doubles form... doubles seems to be the most favored form in the community that I live in... Sun City Grand in Surprise, Arizona....where there are currently 874 members of the local pickleball club. The racket is a hard paddle and the sound of the racket hitting the pickleball, gives a sound that is unique to this game. When we eat our evening meal outside we can hear that sound... we don't mind it be because we know people are active and getting some exercise in a fun manner. Pickleball in Arizona...why so popular? It takes less than five minutes for the rules of the game to be explained and basic strokes demonstrate... therein lies the cause for its popularity it is very easy to learn. The great weather that we enjoy in Arizona means that it can be enjoyed year-round... although during the summer, at least in our area, the activity seems to take place at night instead of the heat of the day. It is a very inexpensive game to play... with rackets going from $40-$70 as an average. 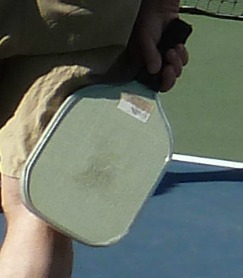 When compared to other sports this makes pickleball very frugal, and affordable for everyone. You can get a great workout, have a lot of laughs, in a very short period of time. So if you do not know what pickleball is all about you will soon.